One of the reasons I love taking my laptop to Starbucks is the blur of ambient sounds in the background while I work. Sometimes I focus better with the murmur of voices in the background, as opposed to the deafening silence at my house. It really just depends on what I’m writing. Disclaimer: This blog post may contain affiliate links. Media Medusa earns a small commission when you purchase through them. But what do you do if you can’t get to a local coffee house? Or library? Hearing your kids arguing in the next room doesn’t help! As with every other problem on the planet, the internet has a solution for you. Ambient sounds are soft, non-specific noise that play while you work or study to help you focus. The sound plays on a loop, which means you might be able to pick out a pattern after a while, but hopefully not. Ambient sounds help you focus better than listening to the whir of your hard drive. Lots of websites offer generic ambient sounds, like coffee house noise, cafeteria noise or city street noise. 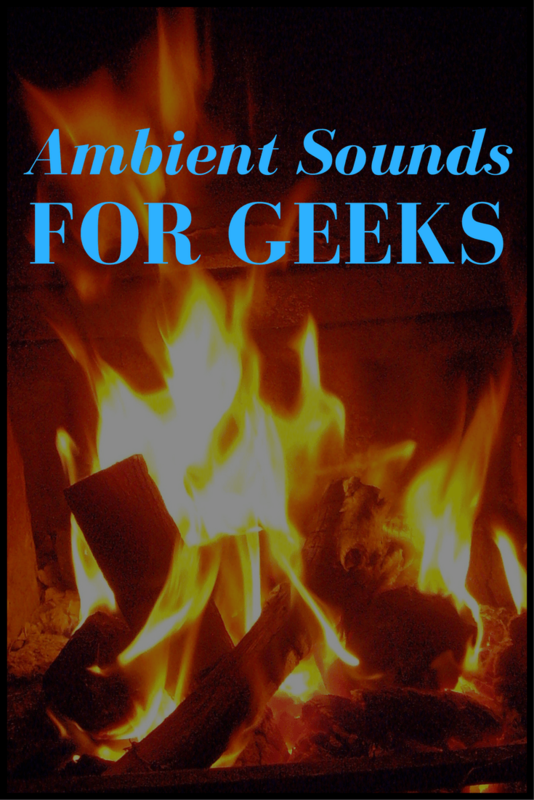 I’ve picked out the best ambient sounds for geeks to transport you and help you focus. It’s background noise from all your favorite fandoms! Harry Potter, Game of Thrones, The Hobbit and Disney. The ambient noise page will open up in a new tab. DON’T CLOSE THAT TAB. Come back to this tab (or window) to continue all your internet browsing. While the ambient sounds tab is open, you’ll hear soothing noise in the background. Optional: If you’re worried that you will accidentally close the ambient sounds tab, make that tab be its own window. Click on the tab at the top of your screen, then pull it away from your browser to make a new window. Optional: Right-click on one of these links, then choose to “open in a new tab” or “open in a new window.” Whichever you think is safest. Gryffindor Common Room – Every room in the world should resemble the Gryffindor common room. There should always be a fire crackling in the grate, plenty of squashy chairs covered in chintz, along with some books and chess sets scattered about. The ambient sounds would be a bit muffled, thanks to the tapestries hanging on the walls. And the whole picture should be mostly scarlet and gold. Good for: Working, quiet reading, cozy date night. Hogwarts Library – If you’re missing your mates from school, turn up the volume on the Hogwarts Library. You can feel like you’re studying (or doing your “revision”) with the rest of your friends. Lucky you, Hermione isn’t actually there to thump you over the head with a book! Good for: Studying (“revision”), working. The only thing I don’t like about this track is that it goes quiet at the end of its loop, so it doesn’t quite sound continuous. Good for: Halloween parties, when it’s too hot outside, studying. Tea at Hagrid’s Hut – One of Harry’s favorite places to visit at Hogwarts was Hagrid’s hut. Although it was small, and sometimes had a dangerous creature lurking about, it was homey. Hear the crackle of Hagrid’s fire, the whistle of the teapot, birds chirping outside, and that dozy dog Fang panting a little too loudly. Good for: Reading quietly, tea time, working. Christmas in the Great Hall – Ah, Christmas. Who doesn’t love the holidays? Here’s a fantastic page for Christmas ambient sounds that have a Harry Potter flair. The general susurrus of the crowd is overlaid with a lovely Christmas carol and the occasional jingle bell. A girl’s “hee hee hee” can get grating, so I would keep this very far in the background, or on very low volume. Highgarden Tea Party – I know what you’re thinking. Relaxing ambient sounds from Game of Thrones? Yes! This track has Greensleeves being plucked on a lute, while partygoers laugh raucously amidst tinkling china. Not a spider in sight! Beware, the laughter can get annoying, and one can only take so much of Greensleeves. Good for: Tea party, Game of Thrones viewing party, luncheon. Winterfell – The only thing that beats a good thunderstorm is a chilly snowstorm. These Winterfell ambient sounds make it seem like you’re scrawling a missive across parchment, while the snow blows outside, along with the occasional wolf howl. Delicious! Good for: Studying, working, viewing party. Red Keep – I imagine the walled garden at the Red Keep is large enough that you can avoid Cersei, the Mountain, Maester Qyburn… well, maybe you should stay away altogether. However, these ambient sounds are perfect for a quiet afternoon at the Red Keep. A cheerful fountain burbles in the background, while exotic birds of all kinds flap and squawk about. Neverland Forest – This is a lovely ambient sounds track! It’s as if you’re sitting next to a babbling brook, with birds singing in the trees, while Peter Pan plays his flute off in the distance. Occasionally, you hear the Lost Boys chuckling or a fairy tittering. Seriously, whoever concocted these Neverland ambient sounds is a genius, because the flute track never gets annoying. Good for: Relaxing, quiet reading. Moana’s Island – There’s no way this track of beachy ambient sounds won’t relax you. Mercy! The surf comes in and goes out, while wind chimes bounce against each other softly, and Grandma hums a nameless tune. Makes me want to squeeze into my swimsuit and squish my toes in the sand. Good for: Sleep, quiet reading, relaxing, meditation. Rivendell – You want to feel sophisticated? Insightful? Play this. These Rivendell ambient sounds immediately raise you above your station. Some lovely elf plays a harp while you listen to the birds tweeting and the soft rush of the waterfall. Salad, anyone? Good for: Studying, working, quiet afternoons. Rainy Afternoon at Bag End – All good Hobbitses work inside on a rainy day, because it’s no good trampling your seedlings in the mud. Light your pipe, pull up a chair, and catch up on your correspondence while Bilbo scratches away at his parchment. I think he’s writing a book, “Here and There Again?” Someone shut that dog up! Lothlorien – If you’re in a dark mood, these Lothlorien ambient sounds might do the trick. The track combines cheerful birds with eery singing. But playing over all this pleasantness is a dissonant tone. It certainly evokes Lothlorien, but I wouldn’t be able to listen to it for long. Good for: Plotting, losing your mind, melancholy fits, migraines. Green Dragon Pub – Nowhere is a Hobbit happier than downing a pint (or half-pint) at the Green Dragon Pub in Hobbiton. These ambient sounds are simply amazing! While the Hobbitses discuss the day’s business, a few musicians play merry tunes on a variety of instruments. If you listen long enough, you might even hear a few Hobbits sing a familiar song! Good for: Parties, possibly working or studying (but you may end up heading out to your local pub). Christmas at Bag End – The homiest track of all. Some talented Hobbit plays a soft Christmas carol, while the wind blows outside, the fire dances merrily on the grate, the Bagginses talk quietly, and a happy child giggles with delight. Bring on the figgy pudding! Good for: Holiday parties, working or studying during the holidays. Thanks for reading! What do you like to listen to when you work? Tell me in the comments! My brain can’t focus with all that going on. You must be a multi-tasking wizard! THIS IS GOLD!!! Thank you for sharing! I also work better with ambient sounds! (Except if I need to write code, then I just need silence). Thank you for all the sources! My favorites are Hogwarts Express during rain, and the ravenclaw common room. Ooo, I don’t think I’ve listened to Hogwarts Express. I’ll have to try that!